A city with so much to see and do, to help you decide I am sharing the top 20 places to visit in London. Many of these are also covered in my one day London itinerary, which helps you to navigate to some of these to maximise your time in London. I have also shared the unmissable and colourful side of Covent Garden, a touch of Romance on Southbank, this supplements those posts with a list of places that are a must see when you visit London. One place I nearly forgot to add in the top 20 places and London Best Tourist sights in London is Monument. This little gem(if you can manage the 200+ steps) has one of the best views in the city in addition to the 5 London Viewpoints I have blogged about. For those that have the energy to explore into the night, I have also shared things to share in London at night. There are plenty of sights in London to get lost in. Below are just some of the top must-see sights to add to your list of places to visit in London. In addition sites like Attraction Tix usually has plenty of deals on tickets for these attractions even though I have tried to include plenty of free attractions below. You can also check out Viator for an endless list of tours in London, from food tours to sightseeing and street art spotting in London. Big Ben is a clock tower belonging to London’s House of Parliament. A lot of people actually don’t know that its official name is actually the Elizabeth Tower. At night, the tower’s four clock faces are lit up and this allows Big Ben become a center of attraction to the public and its a popular attraction to photography at night. Nearest Tube Station: Westminister Station – literally outside the station. This museum is located in Covent Garden and can be found on Trafalgar Square in Westminster City. The museum houses several collections such as The Ambassadors by Hans Holbein the Younger, The Origin of Milky Way by Tintoretto, among others. This is among many of London museums to add to your list of places to visit in London. Nearest Tube Station: Charing Cross Station and Leicester Square Station. The Trafalgar square is a located in Westminster city, London and a must for any visitor to London. This square plays host to many events in London from London’s Westend Live which is an event that brings together all the Westend’s theatre shows on one stage to sample all the shows songs across the day. This is also where you will find London’s famous London Lions. You can read more about Trafalgar Square in one of my post linked. Nearest Tube Station: Nearest Tube Station: Charing Cross Station and Leicester Square Station. The London Eye offers one of the most unique viewpoints in London. It is a giant Ferris wheel at the banks of the River Thames on the Southbank. It has a record of over 3 million visitors in a year and absolute must visit in London. In 2000, it was the largest Ferris Wheel in the world when it was open to the public. You get your London Eye tickets in advance here as weekends and most holidays the queues can be quite something. Nearest Tube Station: Waterloo Station and Westminister Station. It consists of the White Tower and the inner ward. The white tower was built in 1078 by William the Conqueror. This is always where you will find the crown jewels. You can buy you purchase Tower of London advance tickets here. This is also where they had the London Poppies exhibitions at Tower of London which are now touring around the UK. Explore the royal residence of with a Buckingham Palace tour and access the offices and London residence of Her Majesty The Queen! While The Queen makes her annual summer visit to Scotland, the magnificent Buckingham Palace State Rooms are opened up for visitors to venture behind the scenes and get a glimpse into the lives of the Royals. The State Rooms are the heart of the Palace, and are used by the Royal Family to receive and entertain guests on State, ceremonial and official occasions. These spectacular rooms are opulently furnished with some of the greatest treasures from the Royal Collection. You’ll see paintings by Rembrandt, Rubens, Poussin and Canaletto, sculpture by Canova, exquisite Sèvres porcelain and some of the world’s finest English and French furniture. Nearest Tube Station: Charing Cross Station and Westminister Station. In Greenwich London, this is the home and Royal Observatory of the Greenwich Mean Time, a mean solar time. The observatory overlooks River Thames and can be found in Greenwich Park, situated on a hill. This is such a beautiful part of London to explore and not just of the Observatory. For more on what else to see in Greenwich, check out my post on Top 10 Things To Do In Greenwich. Nearest Tube Station: Cutty Sark on DLR. Among many of London’s Instagram-worthy sights is The Shard. London’s skyscraper with 95-storeys. Built on the banks of the River Thames, it houses the luxury hotel the Shangri-La, in addition to many cool restaurants and bars as well as offices. There is also a viewing gallery right at the top. I have had the pleasure of staying over at the Shangri-La, so if you are after an amazing London experience then don miss that. One the blog you can also find a post on a visit to check out the views at the Shard. You can buy Shard tickets in advance here although not always necessary unless its the busy seasons. Nearest Tube Station: London Bridge Station – 1 minute from the station. This multipurpose indoor arena is situated in the O2 entertainment complex at the centre arena has hosted many events since its inception; events such as Under the Iron Sea Tour, ATP World Tour Finals and C2C: Country to Country. A lot of tourists dont know that you can actually climb across the O2. While you are here you can also check out Emirates cable cars to cross the Thames. For where to stay, you can check out these cool hotels near 02 Arena. Nearest Tube Station: North Greenwich Station – only 1-minute walk outside the station. This circus was built with the intention of connecting Regent Street with Piccadilly. The Piccadilly Circus is a round open space and it is also a road junction of West End, London in Westminster City. Piccadilly Circus is a site which is always busy with many people and activities and this is also where many a tourists and locals come to experience London’s retail shopping as it’s a gateway to London’s famous Oxford Street. Nearest Tube Station: Piccadilly Circus Station. Previously called the Collegiate Church of St Peter is a Gothic abbey church in Westminster City, it is known for events such as coronations, burials, royal weddings, and Anglican Church music. This is a stone’s throw from Big Ben and a must see when exploring the area, you can also combine this with a visit to Trafalgar Square and London Eye as all these tourist sights are close to each other and within walking distance. You can purchase advance tickets here to combined tickets for Westminister Abbey and St Pauls Cathedral as both can sometimes have long queues. Nearest Tube Station: Westminister Station. This Anglican cathedral is situated on Ludgate Hill. It is dedicated to Saint Paul, one of the Apostles of the Early Church. Its construction was one of the major parts of the rebuilding after the Great Fire of London. You can have magical views of the city of London from here but I love the views from Madison’s Bar nearby(free). Try to combine both if you can. Nearest Tube Station: St Pauls Station – 2-minute walk from the station. Located within Hydepark, The State Rooms of the Kensington Palace were opened to the public during Queen Elizabeth II’s Diamond Jubilee in 2012, and this was one of the events that led the palace to become a tourist attraction. The Palace has experienced many renovations over the years. This is of course where Prince Harry presented this fiance and now Duchess of Sussex. Near the palace, you will also find the Diana memorial playground, the beautiful Serpentine Lake and Serpentine Gallery. To grab ticket deals to Kensington Palace click here. Nearest Tube Station: Notting Hill Gate and Queensway – about 10 minutes walk from each of the stations. This Grade-I listed park in London is situated in Central London. The park is known for housing debates such as protests and public campaigns, concerts such as musical performances and event grand openings, sports such as football, tennis and the 2012 Summer Olympics that hosted the triathlon. During summer this is the place for a perfect picnic as you can also go for pedlo rides on the Serpentine as well as visit some of the galleries in the park. Nearest Tube Station: surrounded by several stations; Lancaster gate will bring you close to the Italian Gardens you also have Hydpark Corner Station and Marble Arch Station. It is said to be ‘the largest botanical garden in the world’. It is located at the London Borough of Richmond upon Thames. Its official name is ‘Royal Botanic Gardens, Kew’. You can plan a visit to Kew Gardens, as there is so much to see and do there. Nearest Tube Station: Kew Gardens – Station British Rail Station. This sailing ship is celebrated throughout London’s history, and is known as the fastest ship of its time. It is often visited by people and is found in Greenwich, London. 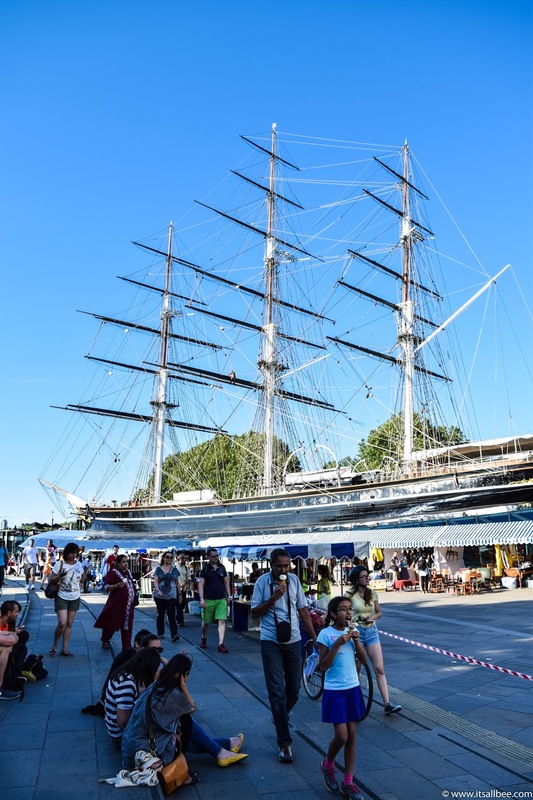 When visiting Cutty Sark, you get to meet the crew, explore the ship and give yourself a spectacular treat. However, you would need to purchase tickets to enjoy this heartfelt experience. This is also a popular attraction with kids and perfect for families visiting London. You can see more in my posts on things to see and do in Greenwich. Nearest Tube Station: Cutty Sark DLR Station. The Imperial War Museum is in charge of the HMS Belfast which became its third branch in 1978. This is known to be a town-class light cruiser initially built for the Royal Navy. However, it is now used as a museum ship sailing on the River Thames. Nearest Tube Station: London Bridge Station. This museum exhibits certain specimens of living things. It is located at Kensington & Chelsea, London. According to records, it has over 4 million visitors annually. The collections in the museum have both scientific and historical values. It is popularly known for its collections of dinosaur skeletons. Also nearby this must-see museum is London’s Victoria and Albert Museum which is a must visit while you are in the area. Also among the top 10 London Museums you need to visit in London. Nearest Tube Station: South Kensington. Liked it. Pin, Share or Tweet! Hey, we are looking for places to visit in London for free. Do you know if any of these places are free entrance or the London attraction pass gives free entrance to any of the places you have listed. 1. Tower of London. FREE ENTRY – SAVE £26.80. 2 1 day Hop-On-Hop-Off bus tour. FREE ENTRY – SAVE £34.00. 3 The View from The Shard. FREE ENTRY – SAVE £29.95. Such a great list. We have been trying to put together an itinerary of the London tourist activities for when we visit London in March. Also, would you know what we need to pack for London in March when we visit? Hi Christine, I have a post on what to pack for London in Spring Summer but also look out my my post on what to wear in London in Winter just in case you visit the city during the cold months. Hi, Bee glad I stumbled onto your blog. I am visiting London in a few months. I would like to include a lot of the places you have mentioned in my London itinerary. I will have day in London and was thinking aways to do London on a budget. Do you know if any of the places you have listed above are all majority free places to visit in London? Also do you think 4 days in London is enough? Can you suggest any other hidden or unusual places to visit in London? We are getting excited about our visit to London during Xmas. Can you recommend on another tourist attraction outside London? Hi Loro, its a little difficult to narrow down a recommendation as that is such a broad question. Check out my other posts on places outside London, like Dorset, Edinburgh, and I have post on the best weekend getaways in the UK if you want inspiration on other cities to check out. Nice post! Love London, even more so the tourist locations in London you have listed. Great post, No doubts from the pictures, London is indeed a place to visit. I hope these listed spots can be accessed without paying a fee. I have visited a couple of tourist attractions near London Eye. Many of the tourist attractions in West London are some of my favorites. Many of the tourist attractions in London can be visited for free or a low fee.